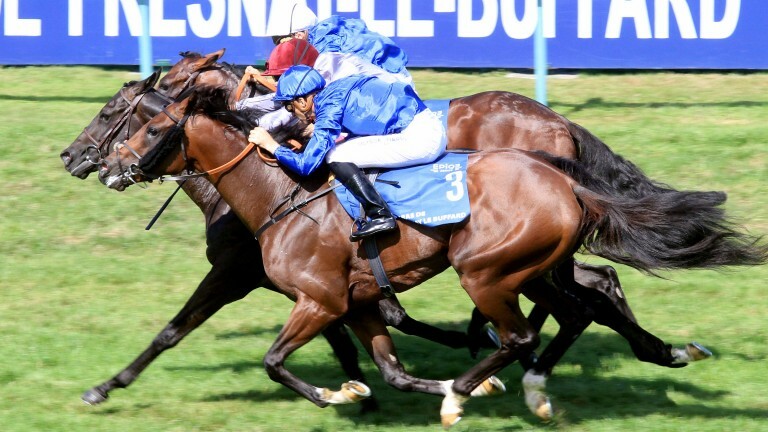 Bin Suroor's stable star was on his A game on the trial ground and the three-year-old looks to have an each-way chance in the Qipco QEII Stakes at Ascot on Saturday before wintering in Dubai where he may be targeted at the World Cup. Robert Havlin steered the Group 2 Royal Lodge winner well clear of a senior lead horse on the long gallop. The son of Kitten's Joy handles cut in the ground something which may stand him in good stead if he takes up his engagement in the Group 1 Racing Post Trophy at Doncaster on Saturday week. The surprise Cambridgeshire winner showed that performance was no fluke when impressing on the Al Bahathri on Tuesday. Meade has a return to the Rowley Mile for the Listed James Seymour Stakes at their finale meeting in mind for his recruit. The Haydock Listed winner is set to become Meade's first runner in the Group 1 Racing Post Trophy at Doncaster on Saturday week and looked the business in his spin on the Al Bahathri. Meade and many others will have to decamp elsewhere from November 1 when the Polytrack facility is to close for two months. Ibrahim Araci's racing manager Rob Speers is a keen cyclist but it was Josephine Gordon who pulled away from the peloton on the son of Uncle Mo who was an impressive winner at Kempton last time. Connections are hoping that the weather holds at Newbury on October 28 when he is slated for the Group 3 Horris Hill Stakes.